Hot, iced or latte – Big Train's powdered Chai mixes are easy to make. Do your tastebuds call for classic flavors like Vanilla or Spiced Chai, or something rich and indulgent like Caramel or Chocolate Chai, or maybe something fun and different like Raspberry or Green Tea Chai? 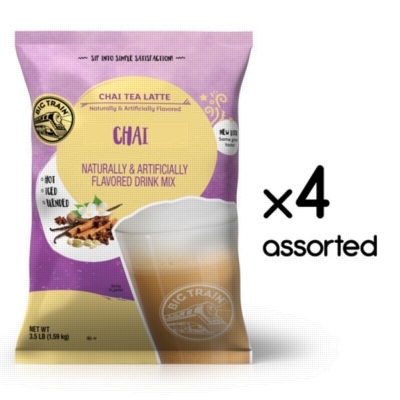 Try all flavors of Big Train Chai Tea in this assorted case of four 3.5 lb. bulk bags. Flavors are Kosher Certified, Gluten Free, Contains no Hydrogenated Oil, and can be made with water or dairy according to preference or dietary need. Enjoy hot, over ice, or blended!